Who hasn't heard of Night of the Living Dead? It's a classic! 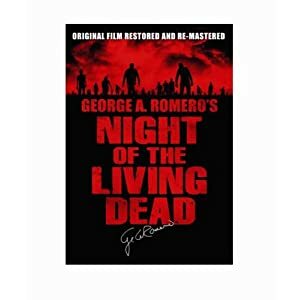 This is one of writer/director George A. Romero's finest films. There was nothing quite like it when it was originally released in 1968, thanks to the mind-blowing effects and sequences that only Romero can bring. Filled with zombie chases, mutilated bodies and suspense, this film is a must-have for fans of the genre. Here's the plot: A contaminated artificial satellite falls out of the sky. Its radiation causes the dead to reanimate and haunt the living. Everyone bitten by a zombie will be contaminated and then turn into a zombie, too. A farmhouse is the stronghold of a small group trying to survive the zombie onslaught.